↑ 1.0 1.1 1.2 Hugman, Barry J., ed. (2010). The PFA Footballers' Who's Who 2010–11. Edinburgh: Mainstream Publishing. p. 179. ISBN 978-1-84596-601-0. 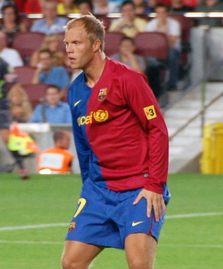 ↑ "Eidur Gudjohnsen". Football Database.eu. สืบค้นเมื่อ 31 July 2013. ↑ "Eidur Gudjohnsen Chelsea career". Bounder Friardale.co.uk. สืบค้นเมื่อ 4 September 2012. หน้านี้แก้ไขล่าสุดเมื่อวันที่ 15 มิถุนายน 2561 เวลา 04:47 น.